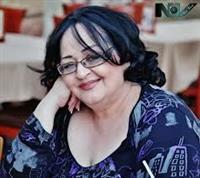 This memorial website was created in memory of our loved one, Flora Martirosian, 55, born on February 5, 1957 and passed away on November 20, 2012. Where Flora Martirosian is buried? 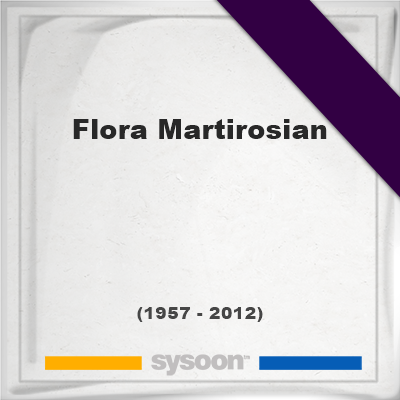 Locate the grave of Flora Martirosian. How to find family and friends of Flora Martirosian? What can I do for Flora Martirosian? She was a popular Armenian folk singer. Martirosian established an International Music Academy after Komitas in USA, in 2002. In 2006 she started A Pan-Armenian Song Contest Festival. Two years later she was co-founder international organization Artist for Peace to raise awareness of crimes against humanity. She died after surgery complications in the USA. Note: Do you have a family photo of Flora Martirosian? Consider uploading your photo of Flora Martirosian so that your pictures are included in Flora Martirosian's genealogy, family trees & family history records. Sysoon enables anyone to create a free online tribute for a much loved relative or friend who has passed away. Address and location of Flora Martirosian which have been published. Click on the address to view a map. Flora Martirosian was born in Gyumri, Armenian SSR, Soviet Union, Armenia. Flora Martirosian died in Los Angeles, United States.